Critics of President Trump's tax reform plan said corporations would just use the massive piles of cash repatriated under the new tax law to buy back more stock. And, as it turns out, Apple has proven them right. During the first quarter, the iPhone maker bought back $23.5 billion of its shares, a record amount for any US company. And, the reason why the stock is higher this morning, is that the company isn't nowhere close to being finished, as in its quarterly report Apple announced that it would earmark $100 billion for a new share-repurchase program. Apple also doled out another $3.2 billion in dividends. Apple's buybacks were a direct result of the Tax Cuts and Jobs Act passed by Republican lawmakers in December. The law allowed Apple to repatriate more than $250 billion held overseas. But in what's perhaps the most shocking statistic, the amount of stock bought back by Apple is larger than the market capitalization of more than half - 275 to be exact - of the 500 companies in the S&P 500 index, including household names like Kroger, Best Buy and Hershey, according to Reuters calculations. 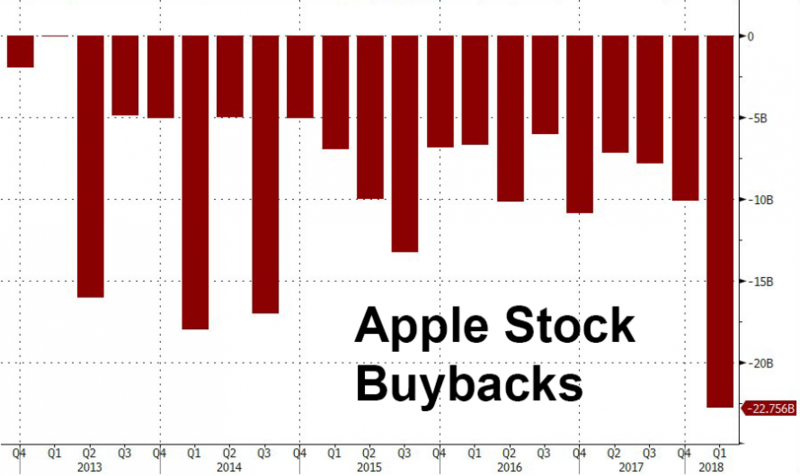 And what's more, Apple's buybacks were equivalent to roughly half of the buybacks announced in April, up from $38.1 billion worth of planned buybacks announced in April 2017, according to Reuters. Of course, Apple wasn't alone: The first quarter of 2018 was the biggest quarter on record for buyback announcements as US firms announced $242.1 billion worth of buybacks.